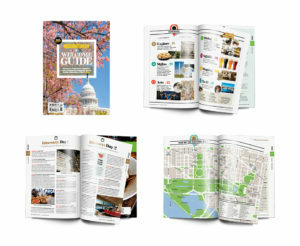 Create a comprehensive insider’s guide that would offer visitors to Washington information they couldn’t get from typical tourist publications, such as recommendations, reviews, and itineraries by The Washingtonian’s stable of experts. The Washingtonian’s experienced critics and writers compiled information on the best attractions in the Washington area—including museums, restaurants, shops, hotels, and more—in an attractive, digest-size publication. The Welcome Guide is published twice a year in print to ensure that recommendations and listings remain current, and the iPad and mobile editions feature photo galleries, maps, and interactive tools. Six hundred retailers, as well as luxury hotels and visitors’ centers, distribute 170,000 copies of theWelcome Guide annually. Each iPad edition receives 41,000 views, and the publication reaches more than 48,000 subscribers biannually via e-mail.